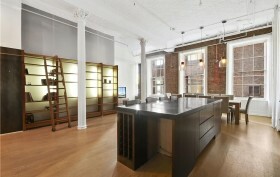 Kristen Stewart just purchased a potential-filled Noho artists’ loft at 1 Bond Street, the New York Observer reports. The “Twilight Saga” actress and model snagged a 3,000-square-foot fixer-upper in the historic Robbins & Appleton building that boasts three exposures, Corinthian columns, a “highly customizable floor plan” and endless possibilities–for $5.64 million. The Robbins & Appleton Building at 1 Bond Street in Noho is considered by some to be among the most attractive cast-iron buildings in the city and definitely one of the neighborhood’s handsomest. Built in 1877 and designed by architect Stephen Decatur Hatch in the Second Empire style, the iconic structure with the tall, slanted blue mansard roof was first used to manufacture watch cases. Designated a city landmark in 1979 and added to the National Register of Historic Places in 1982, the building was converted to residential loft condominiums in 1988. A while back, 6sqft offered a peek inside one of those covetable lofts, an eclectic collaboration between James Dixon Architect and interior designer Carolina George that combines a chic, modern look with luxurious touches and quirky highlights. That top-floor duplex is now on the market asking $6.2 million. The interiors of this two-bedroom, 2,500-square-foot condo aren’t what you might expect to see in an historic Noho loft. 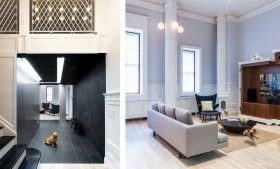 Though there are 17-foot ceilings, big loft widows and a massive skylight, the renovation filled the space with bold and colorful decorative highlights along with modern conveniences. Though not pictured, this sixth-floor penthouse also comes with unconnected private roof space.